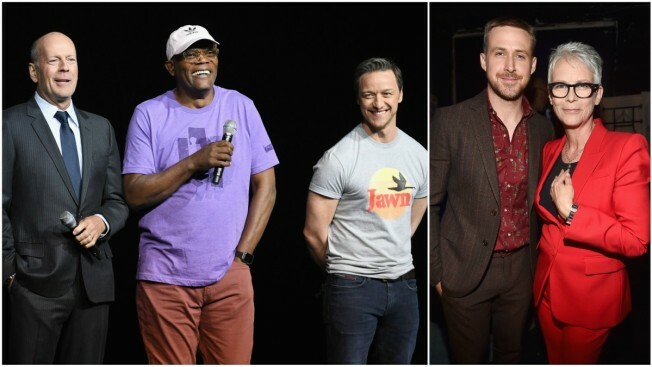 Actors Bruce Willis, Samuel L. Jackson and James McAvoy joined Ryan Gosling and Jamie Lee Curtis and Universal's unveiling at CinemaCon. From a surprise Cher performance to new footage of everything from Damien Chazelle's Neil Armstrong biopic "First Man" to M. Night Shyamalan's "Glass" and Jamie Lee Curtis's return to "Halloween," Universal Pictures pulled out all the showstoppers for CinemaCon attendees Wednesday morning. Cher and a dozen backup dancers brought the house down at Caesar's Palace with a lively performance of Abba's "Fernando." The legendary performer co-stars in the upcoming movie musical "Mamma Mia: Here We Go Again!" a sequel to wildly popular 2008 film, which arrives in theaters on July 20. She plays the mother of Meryl Streep's character. The performance closed out Universal's presentation at the annual gathering of theater owners and exhibitors, where the studio wowed the audience with first looks at a number of their most anticipated releases, including the scary opening to "Jurassic World: Fallen Kingdom," out June 22. Gosling said it was an honor to play Neil Armstrong in "First Man," Chazelle's first movie since he won the best director Oscar for "La La Land." The first trailer for the film teased a tense and heart-pounding experience, showing the famed astronaut heavy with responsibility before his historic mission to the moon. "We have real confidence in the mission, we have every intention of coming back," Gosling, as Armstrong says in the trailer to his young son. The film takes flight on Oct. 12. M. Night Shyamalan also came out to preview "Glass," which blends the worlds of his films "Split" and "Unbreakable," with stars Jackson, Willis, James McAvoy and Sarah Paulson. "It's about time I got the title role in my own mother(expletive) movie," Jackson said. Shyamalan says it's the, "first grounded comic book movie." It's expected in theaters in Jan. 2019. Jamie Lee Curtis also introduced the first footage from "Halloween" in which she returns to the role of Laurie Strode, which she originated 40 years ago in John Carpenter's 1978 film. "We had no money," Curtis remembered about the film. "But John Carpenter and Debra Hill had a vision. It would come to stand as an unyielding sustaining influence in the canon of horror. It is still terrifying in its simplicity." One of the only major stars who wasn't there was Dwayne Johnson, a CinemaCon mainstay, who has the film "Skyscraper" with Universal. But the star and new father recorded a video message for the occasion, explaining that he's on "baby duty" right now and suffering from a lack of sleep. "Skyscraper" was described as "Die Hard" meets "The Towering Inferno," and, director Rawson Marshall Thurber said it was inspired by "Raiders of the Lost Ark" and even "The Fugitive." Speaking of Harrison Ford, the studio's animation arm, Illumination Entertainment, also announced that Ford would be taking on his first animated project ever, voicing a role in the sequel to "The Secret Life of Pets." "The theatrical experience is alive and well and it's the cornerstone of our industry," said Peter Levinsohn, the president and chief distribution officer of Universal Filmed Entertainment. "Whatever challenges and opportunities we may face, we'll face them together."